trade of blacksmith. In the spring of 1874 he came to America, sailing from Hamburg to New York on a White Star liner, and located in Christian county, Illinois, where he worked on a farm for Thomas C. Ponting for seven years. He came to Custer county in 1881, and homesteaded one hundred and sixty acres of land, also secured a timber claim of the same size adjoining on section twelve, township sixteen, range eighteen, where he developed a fine farm and erected suitable buildings. On December 3, 1884, Mr. Jensen was united in marriage with Miss Joanna Hickenbottom, a native of Iowa, who came to Custer county in 1884, and before her marriage pre-empted one hundred and sixty acres of land near Callaway. Her father, Stephen Hickenbottom, was born in Kentucky and died in Iowa in March, 1890. As an infant he and another child were carried by the mother on horseback from Kentucky to Illinois, the father leading the horse, which in addition to his human freight carried all their worldly possessions. The grandfather later moved on westward to Jefferson county, Iowa, where he purchased one thousand acres of wild land - a large estate in those days. The mother, whose maiden name was Mary C. Taylor, was a native of Rockingham county, Virginia, and died in Broken Bow, Nebraska, January 30, 1911. Mrs. Jensen has a sister, Mrs. R. J. Eastman, and a sister, Mrs. Sadie Moore, in Custer county; three brothers, William T., Rolla E., and James W., in Custer county; two sisters in Jefferson county, Iowa, one sister in Oregon, and her twin sister lives in the state of Washington. Four children have been born to Mr. Jensen and wife: Elmer H., a druggist at Berwyn, Nebraska; Steven A., William G. and Cresten R., at home. 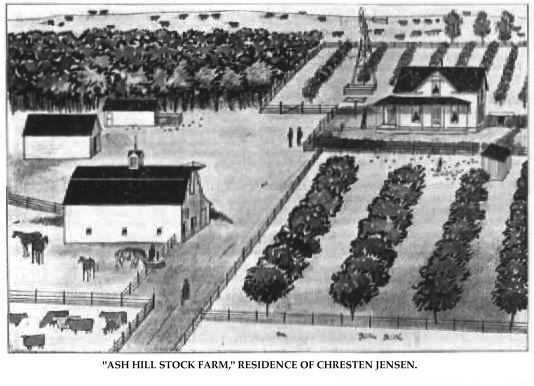 In 1892, Mr. Jensen erected a good house on his timber claim, where he now lives, and he owns a well improved and equipped stock farm of five hundred and sixty acres. He was one of the early settlers of his part of the state, and, in his early days there, passed through the usual experiences and hardships of the pioneer. He is a self-made man and is one of the most successful farmers in the county; he sold but one load of corn from the farm, receiving only enough to buy the material for two shirts, a few pounds of coffee, and a piece of tobacco. Since that time he has fed all his grain and bought much more, marketing the product of his fields in the higher-priced commodities - beef and pork. Mr. Jensen has always stood for the best interests of his community, and is ready to support any measure for the general welfare. Mr. Jensen was reared in the Lutheran faith; in politics he is a republican. When be first settled on his claim, Mr. Jensen "batched it" in a sod front dugout; this had not been completed when the three-day snow storm of October 15 to 17, 1883, came on, inaugurating the winter of the deep snow, so he boarded in the family of another settler. At the time of the storm, Mr. Jensen and a neighbor were seeking land suitable for a cattle ranch out on the Dismal river. The first two days of the storm they camped under the brush and trees of a deep canyon off the river, hovering around their camp fire. The third day they started back, camping at Wild Horst Flat. Here while Mr. Jensen slept, his companion, Mr. Baker, kept the fire going. On attempting to arouse Mr. Jensen when it came his turn to keep watch, he could not be awakened. As a last resort, Baker turned the Jensen horses loose, and shouted the fact in the sleeping man's ears, at the same time shaking him vigorously. This had the desired effect, and after chasing them three miles before the horses were rounded up, Mr. Jensen's blood was circulating and he was wide awake again. Had he not been aroused he would probably have slept the sleep of death. That night they reached Jim Oxner's sod house on Lillian creek, and enjoyed a warm meal and a night's lodging under roof. At the time of the blizzard of January 12, 1888. Mrs. Jensen and her sister, Mrs. Moore, were at the sale helping the lady of the house serve lunch to the attendants of the vendue. Many were unable to get out to go, and the men slept on the floor, completely covering it, all having to turn the same time when growing tired of sleeping on either side. The ladies served breakfast to the hungry crowd when dawn finally broke clear in the east. Among the early hardships is recalled the leaky roofs of the early "soddies," when umbrellas were sometimes necessary. At times, when one of their children was sick, he had to be taken to a neighbor's, whose roof turned water better than at his own home. Their market was Grand Island, eighty miles distant. We are pleased to call attention to a view of "Ash Hill," the residence of the Jensen family. The orchards are an especially interesting feature of the place, comprising three hundred and ten cherry trees, three hundred apple trees, forty plum trees and a grove of wild plum trees, besides an acre of grapes, and small fruit in abundance. "Ash Hill Stock Farm." Residence of Chresten Jensen. Colnel Ellsworth Manzer, one of. the old settlers of Pierce county, Nebraska, occupies a good home and valuable property in section nine township twenty-seven, range one. He has done his share in the upbuilding of his locality and is well and favorably known throughout this of the state. Louise Hinds, was a native of New York, born in 1843, and died in 1901; she was a writer of poetry no little renown, and was a distant relative of Ralph Waldo Emerson, the well-known poet. She was a daughter of Silas and Sophie (Emerson) Hinds. The maternal grandfather was born in New England, of English ancestry. Our subject was reared in Hancock county, and at the age of nine years, when his father was killed he began shifting for himself, living in one family three years, and in another four years, working for his board. In 1877 the family came to Adams county, Nebraska, where the mother took up a claim of one hundred and sixty acres and built a sod house, where they resided many years. In 1880, Mr. Manzer went to Benton county, Iowa, where he was employed at farm labor for three years, until his marriage. Mr. Manzer was married in 1883, to Miss Martha Tatge, and in 1884, with his wife and family, came to Pierce county, Nebraska, and bought one hundred and sixty acres of land from B. S. Williams, in the northwest quarter of section nineteen, township twenty-seven, range one, improving the farm, and putting out four acres of forest and orchard trees. In 1909 he bought one hundred and sixty acres in the southeast quarter of section thirty-three, township twenty-seven, range two, which he later sold, and invested part of the proceeds in eighty acres in section seventeen, northeast of his home farm, and on which a son-in-law resides. Mr. Manzer erected the first silo in the county. He keeps fifteen to twenty milk cows, and through the year raises some seventy-five head of steers and a hundred hogs. Mr. and Mrs. Manzer are the parents of eleven children: Ida, wife of Edward Leach, has one child, named Margaret; Belle, wife of Peter Lackas, has two children, Opal and Alda; Roy, who is married to Ella Whitney, has two children, Mable and Kenneth; William, Alice, married Edward Auwater, who farms on section seventeen; Bessie, Christopher, Emily, James Elmer and Ruth. Ida, Belle, Roy, Alice and Bessie attended school in Wayne, Nebraska. Mrs. Manzer's parents, Christian and Sophie (Coleman) Tatge, are among the oldest settlers in this section of the country, of whom an extended account is to be found elsewhere in this work. Mr. Manzer has had his share of disappointments and hardships incidental to the life of a farmer, having his crops destroyed by hail in 1890 and again in 1905. In 1894 he lost everything by the hot winds. In the blizzard of 1888, he was exposed to the storm for hours getting his cattle to shelter. Mr. Manzer has always been alive to the best interests of his community, and served as county commissioner six years, from 1899 to 1905. He and his family are members of the United Evangelical church, and he affiliates with the Odd Fellows and the Modern Woodmen. Thomas J. Parker, a prominent and much respected resident of Howard county, was born in Ringgold county, Iowa, on the sixth day of July, 1862, and lived there with his parents until he was ten years of age, at which time he came into Howard county with them, his education being received in the common schools here. John M. Parker, father of our subject, was born in New York state, on October 4, 1829. He was married to Elizabeth Merritt, and to them were born seven children, six of whom are living, as follows: William M., Thomas J., Edmund D., Lemuel A. and Irene P., all married and living in Howard county, while another daughter, Annah, lives in Wyoming, the wife of Warren R. Holmes. When a boy of about eight years, John M. Parker settled in Illinois with his mother, one brother and a sister, and remained in that state up to 1850, at that time going to California with others who had the "gold fever," crossing the western plains in wagon trains, etc. He spent four years in California, then returned to Illinois and was engaged in the general merchandise business at Shelbyville in partnership with his brother, carrying on the same up to 1854. After two years he went to Iowa, following farming there for several years. He enlisted in the Twenty-ninth Iowa Infantry in March, 1862, serving to the end of the war, and received an honorable discharge, having taken part in various engagements and seen all sides of the horrors of war. After leaving the army he returned to Iowa, again took up farming and remained there until 1872, coming at that time into Howard county, where he filed on a homestead on section thirty-five, township sixteen, range eleven, his family joining him in the fall of that year. He went through all the sufferings and privations of the earliest settlers of the region, experiencing all sorts of discouragements in getting started on his farm, but stuck to it and gradually succeeded in building up a good farm and home, finally locating on section twenty-four, township sixteen, range twelve, as a timber claim, which he occupied up to the time of his death, which occurred December 9, 1895. Mrs. Elizabeth Parker was born in Belmont county, Ohio, on June 7, 1853, and moved to Iowa with her parents when a child, and there grew to womanhood. She was a woman of charming personality, and most noble character, and with her husband was beloved by all who knew them. Her death occurred in Cotesfield, November 30, 1903. Mr. and Mrs. Parker were active members of the Methodist church of that city. years. For a number of years he owned and operated a threshing outfit through his vicinity, and in this way managed to make a pretty fair income. He lived on the original farm up to 1899, and then moved to section thirteen, township sixteen, range twelve, where he has one hundred and twenty acres of good land, improved with good buildings, etc., and is engaged in stock and grain raising. On April 11, 1889, Mr. Parker married Dora Hansen, the ceremony taking place in Cotesfield, at the home of her parents. Mrs. Parker was born in Denmark, and settled in Howard county in 1882, coming here with her parents, who are well known pioneers in the region. To them have been born the following children: Elizabeth M., Ida I., Ethel L., Cora Myrtle, Alvin J., Sylvia E., Ira L., Eldon, and a baby boy, all living at home and forming a most interesting family group. Mr. Parker is now serving as pastor of the Summit church. He was licensed to preach in the United Brethren church in 1897, and was ordained as a Free Will Baptist in 1900, serving in the same charge as Father Whitney. He has always done all in his power to advance the best interests of his locality, and is known far and near as a man of sterling character and broad mind, also having the honor of being one of Howard county's prominent early pioneers. A prominent place among the list of prosperous and energetic farmers of Valley county is accorded the gentleman just named. For many years he has been engaged in farming and has been a resident of this county since 1890. He came to the state when but a child, in 1871, and so may be counted among the pioneers, those who braved the hardships and privations and became permanent settlers. Mr. White was born on May 12, 1863, on a farm near Eureka, Winnebago county, Wisconsin, the eighth in a family of twelve children born to William F. and Katherine (Clark) White. When he was only eight years old, he came with his parents to Otoe county, Nebraska, and the following year they took up a homestead in the northeast corner of York county on section two. Here the father built a sod house, which was the family residence for seven years. It was here that Mr. White received his education and later engaged in farming. In 1886, he went to Deuel county, and on April 8 of that year he married Miss Nellie Pindell, in Sidney, Nebraska. She was a native of Wayne county, Iowa, but came to Nebraska in 1893 with her parents, Presley and Mary (Fox) Pindell. Two years later. she went to Deuel county, Nebraska, and took up a homestead of one hundred and sixty acres, ten miles north of Julesburg, Colorado. She was successful in proving up on her claim and it was here on her own homestead that, they came after their marriage. In 1890, Mr. White came to Valley county and after a short time purchased the west half, of a quarter section in section eight, township seventeen, range thirteen, and later bought the remaining eighty. He has improved this fine farm in every way, and it is now one of the best in the county. The old sod house which was their first dwelling on the place was torn down in 1902, and a beautiful modern home, with every convenience has taken its place. A substantial barn was built in 1908, making a great improvement on the farm. Mr. White is recognized as one of the substantial farmers of the community. Six children have been born to Mr. and Mrs, White. In order of their birth, they are named as follows: George A., Alice, married Merril Van Horn, who rents Mr. White's farm; Ray, died September 20, 1910, at the age of twenty; Earl, deceased in infancy; Rex P. and Hazel I.
Mr. and Mrs. White have always been closely identified with all movements concerned with the uplifting of their community. Mr. White takes in active and commendable interest in all local and public affairs and enjoys the confidence of his associates. He has been ever at the front when anything was done to further the cause of education. For a number of years he was moderator of the school district, number three, and also served the public for a considerable length of time as town clerk. Mr. White lost his crops by hail one season and by drouth in 1894, raising only a little millet that year. Deer and antelope were to be seen when the family moved to York county and there were antelope in Deuel county while they were living there. Mr. White is a member of the Seventh Day Baptists and of the Ancient Order of United Workmen. In politics he is independent of party lines. Among the early settlers in Madison county, Nebraska, who came here when the country was practically a wilderness and out of its wild state has succeeded in building up good homes and reputations for themselves, is the gentleman above named. Andrew N. McGinnis, son of William and Mary (Hartford) McGinnis, was born in Union county, Ohio, June 8, 1842, and was the eldest son of three children; his sister, who resided in Union county, Ohio, died March 29, 1910, and his only brother is deceased. His father died in 1892, and his mother died on July 4, 1861.
health. On August 16, 1864, he re-enlisted in Company B, One Hundred and Seventy-fourth Ohio Regiment of Infantry, in which he was appointed second sergeant, and served until the close of the war, being mustered out in Charlotte, North Carolina, on June 28, 1865. Mr. McGinnis participated in the following battles: Second battle of Bull Run, Cedar Mountain, Overass Creek, Cedars and Kingston, and many minor engagements and skirmishes. After the war he returned to Ohio, engaging in farming. On January 16, 1869, Mr. McGinnis was married to Miss Mattie M. Figley, also of Ohio, and a few weeks later moved to Benton county, Iowa, remaining there until October, 1870, when he came with his wife overland to Madison county, Nebraska and homesteaded one hundred and sixty acres of land in section twenty-seven, township twenty-three, and also took up a pre-emption claim of one hundred and sixty acres adjoining the homestead. Mrs. McGinnis died on August 23, 1904, and was survived by her husband and four children, the latter being named its follows: Bert B., who is married and has two children, lives in Madison county, Nebraska; Frank J., married and living in Norfolk, has two children; William H., who is married and has one son and lives on the original homestead and Winnie, who is now Mrs. Jesse Stange, and resides in Omaha, Nebraska. Mr. McGinnis served as precinct assessor about eight years to 1908, and as district census enummerator in 1890. He was instrumental in organizing the school in his district, which is number twenty-five, and for over twenty years served as treasurer and director. Mr. McGinnis served as postmaster at Warnerville, Nebraska. In March, 1904, Mr. McGinnis retired from the farm, after having been on the homestead thirty-four years, and moved to Norfolk purchasing a good home where they now reside. On September 20, 1906, Mr. McGinnis was joined in holy wedlock to Miss Hattie E. Kidder, a native of Ohio, whose father, J. W. Kidder, was one of Nebraska's pioneer ministers. Our subject, as before stated, is among the, earliest pioneers of Madison county, Nebraska, and has passed through all the experiences and hardships incidental to frontier life, and is widely and favorably known. He is a member of Mathewson Post, Grand Army of the Republic, post number one Hundred and nine, department of Nebraska, and also is affiliated with the Masonic Order, and is a republican. John J. Jorn has held continuous residence on his present farm in Custer county since April, 1884, and throughout the years has done his share to assist in promoting the welfare and progress of his part of the county. He is a native of Germany born July 20, 1852, second of the six children of Joseph and Dora Jorn, and the only member of his father's family to come to America. His parents had three sons and three daughters and are now deceased, leaving several children in Germany. Mr. Jorn received a common school education in his native country and in October, 1874, came to the United States, his first occupation being work on a Michigan farm. He had followed this line of work in Germany and has continued it since leaving there. In November, 1880, seeking the larger opportunities offered the young man of small capital in the west, he came to Fillmore county, Nebraska, and for five years worked at farming by the month. In April, 1884, he took a homestead comprising the southwest quarter of section twenty-five, township eighteen, range eighteen, which he has improved and developed into a small grain and stock farm, equipping it suitably for this purpose. He has been very successful as a stock farmer and has always done his share to promote the general progress and welfare. Mr. Jorn was married (first) November 12, 1885, to Sarah Anderson, returning to Fillmore county for the purpose. They were married at Geneva, Nebraska, and went to live on the homestead, where three daughters were born to them: Dora, who married Harvey Thombly, of Custer county, has four children; Mary Cynthelia and Laura Viola, at home. Mrs. Jorn died December 12, 1898. Mr. Jorn married (second) April 12, 1904, Christina Elizabeth Schneider, who had two sons by her former marriage, Roy and George Stinhoff, both on the home place. Mrs. Jorn has one brother, Heinrich Schneider, who lives north of Comstock, and one sister, Anne Margarita, wife of Peter Miller, of Custer county. For the past eighteen years Mr. Jorn has served as treasurer of school district number two hundred and forty-two. He is well known in the community as an upright, industrious man and a public-spirited, useful citizen, who has at head the best interests of his county and state. George W. Goff, one of the well chosen public officials of Pierce, Nebraska, is at the head of the street and water system of that thriving and beautiful city, also serving as chief of police, and by his faithful and efficient service in that capacity has gained the confidence of his fellowmen. Our subject is a native of Virginia, son of Samuel Goff, of Washington county, that state, who passed away at the residence of a son at Osmond, Pierce county, Nebraska, in 1907, Mr. Goff having revisited his native state in 1905, and brought his father back with him. The mother died in Virginia in 1902.
pies, and others. Their first settlement was made at Pilger, but they shortly afterwards came to Pierce county, where for some time Mr. Goff engaged in farming and sheep raising on a ranch south of Pierce, and carried it on until obliged by an accident to his right knee to give up farm work. He then moved into Pierce, where for six years he had charge of the "town herd" of cattle, which were herded on the vast prairies west of Pierce, which at that time had hardly a white settler for hundreds of miles. In the fall of 1891, Mr. Goff was elected town marshal, and for fifteen years was the terror of evil doers, who in the earlier days, came to town for the express purpose of "doing the town marshal." His life has often been threatened by them, and "winging" one of them in the spring of 1911, was, in all probability, all that saved his own life. He was next appointed street and water commissioner, and has since filled the position with efficiency. Mr. Goff was again appointed chief of police in 1910, which, excepting three years, when three other aspirants for the position found it too onerous. He has been at the head of that department since 1893. Mr. Goff was married in Virginia, December 24, 1879, to Mary E. Carson, also a native of that state. They have had nine children, named as follows: Mattie, wife of Herbert Morey, of Interior, South Dakota; Ella, wife of William C. Ulrich, of Pierce; Jessie, wife of Eugene Zimmer, farming near town; Kittie, who died in infancy; Roy, who is with his brother-in-law, Mr. Zimmer, on the latter's farm; Lillian, Winnie, Hildred and Eugenia, all of the last mentioned now attending the Pierce schools. The family have passed through all the pioneer experiences here, living through the blizzard of 1888, and have vivid recollections of that severe event. When they came here there were no fences, a furrow being plowed between the different farms to mark the line. Deer and antelope were plentiful, while wild ducks, geese and prairie chicken were so numerous as to be pests, settling on the grain stacks so thickly as to completely cover them. However, they persevered through discouragements and privations which they encountered, and are today among the prosperous and most highly esteemed residents of their county and vicinity. Mr. Goff has been a republican since the early nineties, and is a member of the Ancient Order of United Workmen and Modern Woodmen of America lodges of Pierce. Edward T. VanCleave, a prominent old settler of Nance county, Nebraska, resides in Fullerton, where he is engaged in the contracting and building business, and is counted among the prosperous and progressive citizens of that thriving little city. Mr. VanCleave was born in Washington county, Indiana, on April 22, 1849, and received his education in his home state. He worked with his father on the home farm until he reached the age of twenty-one years, then was apprenticed to a carpenter, learning that trade thoroughly, and following the work continuously. He was married on June 5, 1876, to Marthe Elgin, also a native of Indiana, and their first home was at Livonia, Indiana, where they remained up to 1882. They then emigrated to Nebraska, settling in the village of Fullerton, and have resided here ever since. They are among the earliest pioneers in the town, and have seen the growth and progress of the section from its early settlement, building up in the meantime for themselves, a competence and gaining the confidence and high esteem of their fellowmen. Mr. VanCleave has worked at his trade constantly, and has helped erect nearly all of the principal buildings in the locality. During the years 1893-1901, Mr. VanCleave held the office of county supervisor, and in those years the handsome court house of Nance county was erected. He has also been deputy city assessor for two terms, his term extending from 1905 to 1909. Mr. and Mrs. VanCleave had one child, which died in infancy. Our subject was the fifth in a family of nine children, while his wife was one of seventeen children, and both have several brothers and sisters living in different parts of the country. The parents of both are deceased. The west has proved to be the haven of many of the old soldiers who have from time to time drifted into the rolling plains. Of these who have found a comfortable home within the borders of Nebraska, we take pleasure in commending the venerable John Grant. of Lee's wagon train, and were near headquarters when Lee surrendered, and where the news of the president's assassination reached them. After hostilities closed in the east, the Sixth Michigan was sent back to City Point and thence by way of Washington and St. Louis, where they were loaded into transports and sent up the river to Fort Leavenworth. Here they were divided, small detachments being sent to various points, that Mr. Grant marching up to the Platte bridge and as far as Julesburg. He was mustered out Fort Leavenworth, and discharged at Jackson, Michigan, November 24, 1865. At the battle of Gainsville, where Lee's wagon train was captured, Mr. Grant was wounded in the right hip by a minnie ball and has suffered from the wound, at times, ever since. After the war Mr. Grant continued farming, lumbering and rafting in Michigan until coming west in 1882. He filed on a homestead in Knox county, near Sparta, where his brother-in-law, Neal Walters, had a claim, and after proving up and securing title to his land he made his home in the Walters household. Neal Walters was born in Canada and settled in Michigan in Kent county. Here he enlisted in Company H, Sixth Michigan Cavalry, serving through the war, a comrade of Mr. Grant, participating in the same battles and the campaign on the plains. He was married to Catherine Grant in Michigan, July 1, 1866, and came to Nebraska in 1879, settling on a homestead at Sparta, as before stated. After removing to Boyd county, in 1895, he kept hotel at Lynch for a number of years. He died in Lynch, February 12, 1910, after a long and useful life. Mr. Grant is a republican, and with his sisters is a member of the Methodist Episcopal church, He is a prominent member of the Grand Army of the Republic, and one of the familiar figures about the town. He is genial, courteous, and cordial, one of the kind it does one's soul good to meet. David Thomas is one of the oldest settlers of Platte county, Nebraska, and has witnessed the country's growth from a wild, bleak, wind-swept prairie to a land of beautiful homes, occupied by an intelligent, contented and prosperous people. He has coped successfully with the varying fortimes of pioneer life, and has surrounded himself with the satisfying evidence of work well done. David Thomas, retired farmer, son of Thomas and Mary (Walters) Thomas, was born in Bankyffelin, Carmarthenshire, South Wales, England, September 1, 1852. He was educated in the schools of his home country, and when nineteen years of age came with three Welch farmers to America, looking for a suitable location on which to form a Welch colony; land on Shell creek, twenty-five miles northwest of Columbus, Platte county, Nebraska, being chosen. Mr. Thomas soon secured work with an extensive stock dealer, Guy C. Barnum, where he remained in charge of the Barnum stock for something over two years. He then began acquiring land. A man named John N. Lewis had pre-empted where the Thomas home farm is, and had proved up on his pre-emption and he had taken eighty acres adjoining this as a homestead, and Mr. Thomas bought his rights and took possession of the land. He has since added to his landed interests until he is now one of the largest land owners of Nebraska land in Platte county. On October 10, 1877, Mr. Thomas was married to Miss Mary Elizabeth Mister, also a native of Wales, coming to America in the fall of 1874 with her parents. Seven children have been born to Mr. and Mrs. Thomas: William Henry, resides on the homestead farm; Amy, wife of Arthur Wolf, has one child and lives in Humphrey, Nebraska; Thomas D., who resides at home; John R., deceased November 30,1884; and Edward J., Mamie and David A., who reside under the parental roof. Mr. and Mrs. Thomas lived on the homestead farm over thirty years, the farm being finely equipped and highly developed, containing seven hundred and twenty acres, four hundred acres of which is under cultivation, fifty-five acres in hay land, and the rest is devoted to stock raising. Fine buildings and two artesian wells add to the value and beauty of the farm. Mr. Thomas in the early days was instrumental in organizing his school district, that of number thirty-one, and served as director of same for twenty-five years. In 1885 Mr. Thomas donated two acres of his home farm for church property and in 1886 helped to build a Calvinistic Welch Methodist church. In 1904 our subject retired from the farm and moved to Columbus, where he purchased a good home where they now reside. In 1886 Mr. Thomas and family made a trip to his native country, spending six months in various parts of Europe. Mr. Thomas has made two subsequent trips to England. Mr. and Mrs. Thomas are among the earlier settlers of Platte county and have been successful and prosperous. Mr. Thomas came to Nebraska with one hundred dollars as his sole possession, but through his untiring energy, enjoys much prosperity, and besides various business interests, owns two thousand seven hundred and twenty acres of Nebraska land. They have passed through all the experiences incidental to pioneer life, and well remember numerous hunting trips of the early Nebraska days, when elk, deer and antelope and other game were plentiful. These trips were full of adventure with the Indians and were fraught with much danger. Mr. and Mrs. Thomas are widely and favorably known, enjoying the highest esteem of all who know them. Located very pleasantly in section thirty-one, township twenty-five, range seven is to be found the gentleman whose name introduces this biographical writing. He has been identified with the history of Antelope county, Nebraska, for many years, and his contributions to the making of eastern Nebraska have been of such industrious habits, persistent and invariable honesty of purpose and force of character, that he is widely known as one of the leading and influential early settlers of the county. Mr. Griffen is a native of Washtenaw county, Michigan, born March 10, 1855. His father, Stephen Griffen, was born in 1813, in Duchess county, New York state, but was of Welch descent, and died in November, 1867, when our subject was but twelve years of age. Our subject's mother, Emerett (Cutler) Griffen, was a native of New York state also, being of Irish descent, born in 1825. Mr. Griffen received his schooling in his native state, and after his father's death remained on the farm to help his mother. In 1879 Mr. Griffen came to Douglas county, Nebraska, where he remained about eleven years, then coming with his family to Antelope county, in 1890, where he bought one hundred and sixty acres of railroad land. In 1884, Mr. Griffen was united in marriage to Miss Lucia Phelps, who was born in Pontaic [sic], Michigan, October 5, 1855, and Mr. and Mrs. Griffen are the parents of six children, whose names are as follows: Agnes, Mabel, Myrtle, deceased; Edna, Wallace and Lizzie. Mr. Griffen has taken an active interest in public affairs and has filled the office of assessor of his township intermittently for twelve years, and is a member of the Ellsworth camp, number sixteen hundred and forty-six, Modern Woodmen of America lodge, at Clearwater, Nebraska. He is well liked, and bears the high esteem of all who know him, as does also his wife and family. Francis S. Bivens was one of the very early settlers of Nebraska, and now owns a fine grain and stock farm on section thirty-one, township seventeen, range seventeen, Custer county. He is a native of Fulton county, Pennsylvania, born January 13, 1845, fifth of nine children born to John and Mary (Leafti) Bivens, who had five sons and four daughters. The father died in Pennsylvania in March, 1865, and the mother, with four of her children, removed to Illinois, where they lived on the line of Knox and Fulton counties for eleven months. Late in October, 1867, they moved to Seward county, Nebraska, and became true pioneers of that section of the state. She and her son, Francis, each took a homestead there, and later two of the other sons, on coming of age, did the same. Francis S. Bivens was born and reared on a farm, and in early life spent a short time at mining in Bradford county, Pennsylvania. He was married, March 9, 1865, to Miss Lizzette Fegley, and in the fall of 1867, removed to Illinois. The following year he came with an ox team from Illinois to Seward county, the six weeks trip being one of hardship and even danger; in some places even water was refused them, either for personal use or for stock. His mother and some of her children came with him, and his wife, in speaking of the trip, tells of walking many miles of it. There was at that time but one cabin at Seward, and but two at Lincoln. On first coming to Seward county, Nebraska, the family lived in a log house, which was later replaced with a large soddy, and this in time by a good frame dwelling. At that time buffalo still ranged the prairies west of Kearney, and the Indians at times were hostile, committing occasional depredations. Mr. Bivens well remembers the three-day blizzard of March, 1869, one of the worst since civilization spread to the west of the Missouri. On the fourth day, when the storm abated, he took a load of charcoal to Lincoln, to market. Those were strenuous days of great hardship, but easily borne, because of the early settlers' great hardihood. Mr. Bivens and wife have nine children: Thomas, married and living in Sherman county, has five children; George, married and living in Rossville, New Mexico, has one child; Minnie, wife of Henry Oschlo, of Custer county, has six children; Daniel C., married and living in Hitchcock county, Nebraska, has two children; Harry, married and living six miles north of Sargent, has five children; Mary, wife of William Oschlo, of Greeley county, has four children; Daisy wife of Otto Conway, living in the state of Washington, has two children; Frank, at home, and Pearl, wife of John Tucker, of Custer county has one child. In political views, Mr. Bivens is democrat on national questions, but votes for the man in local elections. He is a member of the Ancient Order of United Workmen. After being identified for many years with the upbuilding and progress of the earlier settled portion of Nebraska, Mr. Bivens sold out there in 1890, and moved to the state of Washington but returned to Nebraska the following year, and purchased the northeast quarter of section thirty-one, township seventeen, range seventeen, Custer county, where he has a fine farm and a comfortable home. He and his wife are well known the community, and are considered desirable additions to the social life of the neighborhood where they live. They are both busy and active in all public matters calculated to advance the general welfare, and have a wide circle of friends.